Venetian Bead in the Scavo technique often used in the furnaces of Murano. Scavo means "unearthing" and has been used to produce glass which resembles the ancient glass unearthed in Roman and Etruscian ruins. 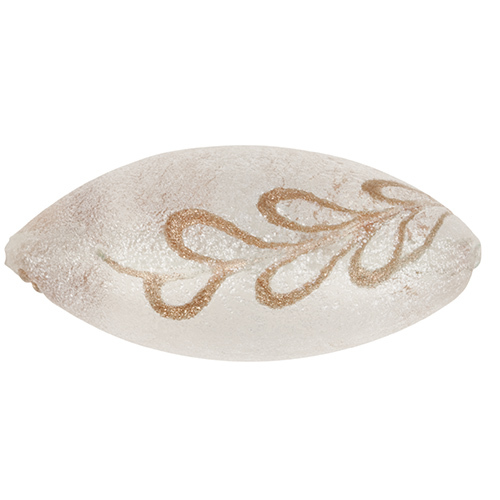 To produce this the hot bead is rolled in extremely fine frit (ground glass) which gives the exterior of this bead texture. The gold not unlike the ca'd'oro method is also contained in the frit. A branch of leaves is incised into the hot bead using a cane of aventurina. The look is soft and the texture adds to it's beauty. This is an oval approximately 32-35mm in length and about 13-15mm in diameter at the widest part. This begins with a base of clear Murano Glass.